​​​​​ SAN MARCOS – The first multistory steel, modular apartment complex in Texas has broken ground. 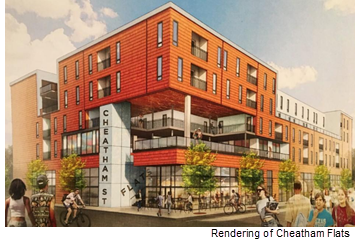 Cheatham Flats will house 234 beds in a mixed-use, urban development at 401 South Guadalupe St. The complex will have 187,000 sf of housing and parking plus 5,000 sf of retail space for a coffee bar and restaurants. About a mile from Texas State University, the $22 million project will consist of “volumetric boxes” to be assembled on site like a stack of Legos. Made with American steel, the 11-feet tall by 36-feet long units will be fully furnished, then wrapped in a weather-resistant casing and shipped to San Marcos.